The systematic methodology of unfoldment of inner potential Divinity, by moving towards self–perfection is referred to as Yoga by Sri Aurobindo. The present curriculum on Yogic practices offered by AVK is tailored for an all-round development of the physical mental and vital component of children. First some loosening and stretching exercises called sithilikarana Vyayama are introduced with help to make the body supple and flexible so that they aid in Asanas that are designed to conserve the energies and transform them to subtle forms of mental energies. 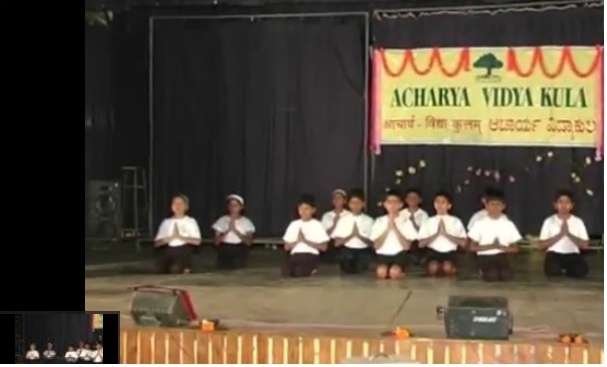 The curriculum in Acharya Vidya Kula introduces some of the aspects mentioned above and is by no means exhaustive. While it covers no theoretical ground, the material is purely instructive in nature meant to help children in the practice of loosening exercises. Surya Namaskara, Asanas, Pranayama, through these practice one gets a preparatory training for pursuing higher techniques leading to states of increasing harmony and bliss. The importance of Yoga as a physical, mental and spiritual regimen in one's life is sought to be emphasized. AVK annual events have always included Yoga demonstrations by students. (please see video linked on this page). Swami Vivekananda proclaimed “Each soul is potentially Divine”. This state of Divinity or self perfection is the state of pure consciousness, maximum creativity and bliss. Since every individual or society is always striving to achieve greater happiness, bliss, creativity and higher mental faculties, Yoga clearly is the real solution, both for individual fulfillment and social harmony. Divergent are the methods of Yoga. Unless one sees the underlying unity and harmony, one is apt to lose track amidst diversities. Once the insight into the “Unity in Diversity" develops, the truth about the comprehensive nature of Yoga emerges. Asanas are scientific exercises they not only make us strong and supple but they also help to remove impurities from our bodies. By practicing asanas the circulation, respiration, digestion and elimination are all improved. Asanas also improve the memory, concentration and will power, Asanas are thus invaluable for the health of body, mind and developing an inner awareness.